Conversations about racism and white privilege are so difficult because they tap into the pain of our nation’s history and our own family histories, as well as the ongoing trauma of racism. After many years, I’m just beginning to see how essential this conversation is for myself as an individual and as a member of a community interested in justice and sustainability. White people and communities need to be able to talk about racism, and take responsibility for it. This is not about guilt, shame, or blame. This is about deep responsibility and awareness, and a willingness to grow and change. These character traits are already present in a lot of people in the intentional communities movement. We just need to apply them to questions of race, racism, and racial justice. Acknowledging that racism is in me has been an important part of taking responsibility for racism’s impact on me and on the communities where I’ve lived. I’d like to share my personal journey around racism and white privilege, some working definitions and vocabulary, and my experience in two intentional communities before offering some suggestions on a way forward. My family comes from a small coal-mining community in rural West Virginia. Both of my grandfathers, and several of my uncles and cousins worked for much of their lives in the coalmines. One of my grandfathers died of black lung and lung cancer in his 60s when I was eight years old. Even though my parents left West Virginia before I was born, we visited there often when I was young, and saw relatives sacrificing their bodies and lives for the coal industry and living in near-poverty conditions even though they were working extremely hard. I grew up feeling that my family had been exploited, and I developed a sharp sensitivity to economic injustice. When I was in college at Penn State University in the 1980s, I became involved in the Anti-Apartheid movement on campus. The racism and injustice in South Africa was clearly visible, and it moved me to act. However, when friends of color directed their attention to the racism on campus and in the local community, it was initially difficult for me to see and accept the extent of racism at home and the possibility that I could be a beneficiary of it. I still preferred to talk about economic injustice because that was what my family had suffered. It was much harder to understand and take responsibility for how racism had given me advantages and privileges in this society. Slowly, I began making connections to racism in the United States and to my own privileges as a white person. In recent years, I’ve learned some distressing aspects of my family history: one of my great-grandfathers was a member of the Ku Klux Klan in West Virginia, and some of my ancestors owned slaves in South Carolina in the 1800s. These revelations disrupted my simple and comfortable story of my family being the victims of injustice. My family history is interwoven with our collective history of colonialism, the extermination of native people, the enslavement of African people, and the oppression of immigrants and working people. My family’s pain of poverty and exploitation in the coalmines, while real, does not negate or diminish the centuries of slavery, segregation, and racism suffered by people of color. Nor does it give me the license to neglect the current reality of racism in our country, nor allow me to deny the many doors opened, opportunities offered, and advantages given to me as a white male in this culture. Over the last few years, I have learned a lot more about racism reading books like Witnessing Whiteness, watching films like “Race: The Power of an Illusion” and “13th,” and taking workshops and trainings. I’ve come to a better understanding of racism as a system of white privilege and power. I’ve come to understand that racism persists because of silence and inaction. And I’m now able to acknowledge that racism is in me and in the communities of which I am a part. So, what is racism? And what do I mean when I say that racism is “in” me? Racism is a system that divides people on the basis of racial categories and distributes benefits and burdens according to those groupings. Even though racial categories are quite powerful and still impact our daily lives, they have no biological or scientific basis—race is a social reality and a biological fiction. In the US, the main racial categories are white and black. These categories were created during the European colonization of the Americas and the enslavement of people from Africa, and they allowed wealthy elites to divide and rule by separating poor whites from people of color, while also providing ideological cover for the brutality of slavery. After 250 years of slavery and another 100 years of segregation, during the last century people of color were systematically excluded from social benefits and opportunities like Social Security, Minimum Wage protection, Federal Housing Loans, and Educational benefits for several decades, allowing for the creation of a large white middle class while simultaneously creating a large black lower class. Today we still see the legacy and ongoing effects of racism in the criminal justice system and the unjust distribution of resources and opportunities across racial groups. Racism benefits people who look like me, and harms people who don’t. Because I’m categorized as white in the US, I’m much less likely to be pulled over by the police, and much more likely to be let go when I am stopped. I’m less likely to be charged, tried, convicted, and punished for the same crimes and violations as people of color. I’m more likely to get a loan or a job or a safe place to live. Whites have around 10 times the median net worth of blacks in the US, which compounds from generation to generation, and makes it more likely for me to receive financial assistance from my parents and be able to provide financial assistance to my children. It’s easier for me to travel across country and find services and support, and feel safe and welcomed along the way. It’s easier for me to grow up with a sense of dignity, self-respect, and self-confidence that I can succeed and thrive in this society. Racism is a system, and should not be equated with racial prejudice or bias; individual racial bias is morally wrong, but doesn’t always indicate the presence of a system of racism. Likewise, a very damaging and harmful system of racism can persist even as personal racial prejudice is decreasing. While the open expression of racial hatred and prejudice by white supremacists is shocking and disturbing, the core of racism today—and its greatest danger and harm—is that it functions as a system that unfairly burdens and harms people of color and rewards white people, regardless of the conscious intentions or ideologies of individuals in the system. Because of the horror, trauma, and violence in both the history and current system of racism in our society, many white people are wary of conversations about race and racism. We are afraid of being labeled “racist” and held responsible for 400 years of oppression. Like most white people, I don’t enjoy being called a racist or being called out for racist remarks and behavior. But what I have found quite helpful is to acknowledge up front that racism is in me: not only do I have prejudices and stereotypes and reactions inside me that were instilled by a culture of racism, my life is shaped by opportunities and resources offered to me because I’m white and denied to others because they are not. I’m not saying that I am completely and exclusively shaped by racism, just that racism has been a crucial factor in determining who I am and how I live as a white person in 21st Century USA. Of course there is racism in me—just as there is mercury in the soil, in the water, and in my body from the burning of fossil fuels since the start of the Industrial Revolution, so also the toxins of racism are lodged inside our society and inside me. After hundreds of years of colonialism, slavery, segregation, and discrimination, it’s not so easy to clean out our social system or my personal system from the poison of racism. I was raised in an economic and cultural environment constructed on the basis of racial categories and oppression, and those toxic categories affect my thinking and behavior—and impact the benefits and harms I encounter—on a regular basis. Of course there is racism in me, in us all, and in our institutions and communities. Because racism is in me and in all of us, it affects us every day. And because I am interested in justice, sustainability, and community, I am moved to address the reality of racism in myself and in my communities. Now I can see that the problems with race and racism within intentional communities are the same common issues among white people in the US: feeling safer talking about diversity; denial of the existence or extent of racism; historical inequity that has separated most whites and blacks culturally and economically; claims of “colorblindness” by well-intentioned whites; and insensitivity and a shallow understanding of injustices faced by people of color in the US. One of our most prominent members initially resisted the adoption of this principle because he felt that racial justice was not central to the mission of the community. While he supported racial justice work personally, he didn’t see the relevance of this work to the project of creating a sustainable community. His view of racial justice and racism as marginal or secondary work is quite common among whites in the intentional communities movement, as it is in the broader culture. I believe that this inability to see the connections between addressing racism and the mission of sustainability is not only a misunderstanding of the depth of sustainability, but also an example of white blindness, a self-protecting maneuver and one of the privileges that whites have in this society that allow us to avoid confronting the realities of racism. In addition, many whites experience trauma in this society because of economic injustice, sexism, environmental damage, and other forms of the abuse of power, and they may worry that these important issues will get swept aside if serious attention is given to racism and racial equity. No, I wasn’t saying that at all. I was actually trying to differentiate myself from ideological racists and white supremacists, while still taking responsibility for how racism shapes my life. But many white people have a fundamental challenge listening accurately in a conversation about racism, much less engaging in the deep work of overcoming it. That’s one of the reasons why there are so many all-white or mostly-white intentional communities. How can we expect people of color, who cannot avoid the real harms and dangers of racism in their everyday lives, to feel safe building community with people who struggle to even have a conversation about racism or acknowledge that it is real? Through these experiences, I’ve come to see that racial justice, and hence the hard work of addressing racism, is essentially connected to the creation of sustainable communities. Sustainability requires that we address the use and abuse of power, the fair distribution of resources, the scarring of our natural environment, and our deepest values and consciousness around our relationships to the environment and to each other. How can a community—especially a community in the Americas—claim to be working for a sustainable future if it is not addressing the past and present realities of racism? To put it in stark terms: any community owning land in the United States is living on soil soaked with the blood of Native Americans, and in the South, our land is also soaked with the blood of slaves. That oppression and exclusion is part of what has made it possible for white people like me to accumulate resources, liberties, and opportunities, and to use those assets to create intentional communities. As a basic step of accountability and justice, we have a moral responsibility to address how racism is shaping our lives and our communities. This is difficult and daunting work. And yet if we don’t accept the challenge, we risk seeing our efforts at building sustainable communities devolve into the creation of privileged and isolated mini-utopias that serve only whites. Responsibility for Self-Education: White people and communities must take responsibility for deepening our own understanding of racism and how it affects our lives. Commit to building knowledge, awareness, and sensitivity within your group (reading, trainings, ongoing conversations). Develop a common vocabulary that makes it normal for members to name and discuss Racism, White Privilege, and White Supremacy as facts of our social and interpersonal environment. 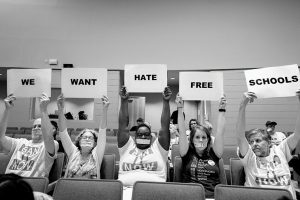 At Hart’s Mill, we are encouraging our members to participate in racism education, and last summer our members organized an in-house training that brought in trainers from SURJ, Standing Up for Racial Justice. Implement a Vision of Racial Equity: Create an internal culture that recognizes and addresses historical inequity, and creates avenues to welcome and include people of color. At Hart’s Mill, we are currently discussing a Sliding Scale system for buying into the community that would offer lower buy-in costs to people of color (and potentially to other historically disadvantaged groups). When I mentioned this in a workshop at the September 2017 Twin Oaks Communities Conference, a white participant challenged the idea, and asked whether it would be demeaning to people of color to offer a discounted rate for joining the community. Some people of color in the workshop responded by saying that they had no problems at all with such a system, and would appreciate any enhanced opportunities that recognized the historical inequities in our society that have affected the ability of people of color to accumulate assets and wealth. Another workshop participant observed that such a system could be understood as an act of reparation for the harms of racism. Build Relationships with Racial Justice Organizations: Even if the racial composition of a community does not change much after working on racism, predominantly white communities can still build relationships with people of color and racial justice organizations, and can make important contributions to the larger society around issues of racism and racial equity. A handful of us at Hart’s Mill have been active in the past year in a local group called the Hate Free Schools Coalition of Orange County, where our land is located. An African American mother of children in the Orange County, North Carolina schools founded the Coalition after she saw the Confederate Flag being displayed prominently by some white students on their clothes, backpacks, and vehicles. When she asked the School Administration for action, they ignored her, and she organized in the community to call for the banning of the Confederate Flag in schools. Members of Hart’s Mill answered the call and attended school board meetings to speak out for a ban, and also worked to educate the community. After almost a year of work, and much resistance, the school board finally shifted after the August 2017 display of racial hatred and violence in Charlottesville, Virginia (about three hours away from Orange County). The board agreed to ban the Confederate Flag and other white supremacist symbols for the 2017-2018 school year. Our community continues to look for ways to partner with people of color, racial equity education groups, and racial justice organizations. Avoidance: claiming colorblindness (“I don’t see race”), transcendence (“I’m beyond race”), emphasizing ethnicity instead of race (“I’m an Irish-American hillbilly, not white”). These coping strategies are signs of privilege, for white people can often get away with not looking at or talking about race and racism. What’s worse, these avoidance maneuvers are deeply disaffirming to people of color, and diminish or outright deny the history, legacy, and ongoing reality of racial injustice. Basically, these avoidance strategies communicate to people of color that their experience of racism isn’t real and/or doesn’t matter. While often well-intentioned, these behaviors foster mistrust and can cause a lot of damage. Grasping for Affirmation/Forgiveness from People of Color: another common pitfall for white folks occurs when white people who are aware of racism and are taking actions to overcome it are fueled by an internal desire for affirmation or forgiveness from people of color. We want people of color to tell us that we are alright, that we’re not racist, and that we’re one of the “good white people,” in order to help us heal our own wounds and guilt around the history and reality of racism. But this is unfair to people of color and puts unnecessary pressure and weight on them. It is not their job to affirm or forgive or heal us. It is our job to find our own support in navigating and healing the inner and outer wounds of racism. Educate Me, Please: oftentimes, white people will rely heavily on people of color to guide us and educate us on matters of race and racism. On the one hand, it is natural to turn to people with more insight, experience, and understanding of an issue to mentor us when we are learning something. On the other hand, this is too much pressure and responsibility to put on people of color—there’s a lot of white people out here who need educating! Furthermore, people of color are already burdened with the daily harms and injustices of institutional racism. While relationships with African Americans and other people of color have been essential for my own growth and learning, it’s important for white people to respect boundaries, establish balanced relationships with people of color, and take responsibility for our own education on race and racism. Find and Cultivate Resources and a Shared Vocabulary: Find Racial Justice and Racism workshops in your local area and take them, or bring in out-of-town trainers if there aren’t any locally. Read books like The New Jim Crow and Witnessing Whiteness, and articles like “White Privilege, the Invisible Knapsack.” Watch films like “13th,” directed by Ava Duvernay; “Race: The Power of an Illusion”; and “12 Years a Slave.” Go to websites like whiteawake.org. Create your own list of helpful resources as a group. As you do, you’ll be developing your own framework, vocabulary, and culture for addressing racism and white supremacy. Grieve the Painful Legacy and Ongoing Reality of Racism: The history and current reality of racism is incredibly painful and agonizing to me. I grieve it everyday. And I regularly feel grief at seeing white people, including those in positions of power, denying or diminishing the reality and pain of racism. I grieve at seeing public institutions and officials that are so slow to respond, if they respond at all, to the concerns and needs of people of color. It’s painful to watch, and it grieves me tremendously. It’s also quite painful to witness members of my community and others deny the urgency of addressing racism. So part of my ongoing work is recognizing and grieving pain. Racism is damaging and painful for everyone—to differing degrees, of course, but the dehumanization of racism affects us all. That’s why for white people, it is in our self-interest to confront and overcome racism—we should be in this for ourselves and our own liberation from systems of oppression, along with supporting our friends, neighbors, and fellow citizens who are people of color. But doing this work involves uncovering traumatic histories and ongoing painful experiences that can leave us shocked, drained, and demoralized. That’s to be expected. As Joanna Macy points out, our capacity to feel this pain is a sign of our deep interconnections to other people and to all of life. In my own journey, it’s been important to make time to grieve, and not to hide from the sadness of the reality of racism and racial injustice. I believe that racism is in me, and in all of us, and that white individuals and communities have a profound and urgent responsibility to address racism in our selves and in our society. This essay has focused on racism, but the call to address racism doesn’t imply ignoring the other crucial work facing those of us in the communities movement: sustainability, gender equality, responding to global warming, economic justice, creating collaborative culture, environmental regeneration and healing, and other essential issues. Our concern about one of these issues does not prevent or exclude our concern about the others—in fact, many of these issues are deeply interconnected and cannot be addressed in isolation from one another. It’s crucial for me to approach the work of racial justice and healing with patience, self-care, and compassion: we’re all learning, and this is long-term, cross-generational work that addresses deep trauma, pain, and injustice in our world. And it is essential for those of us dedicated to sustainability, justice, and community to commit ourselves to this work. Joe Cole is a Facilitator and Consultant for communities and nonprofit organizations. He has a Ph.D. in Philosophy, and is a Visiting Instructor at the University of North Carolina at Greensboro. In 2017, Joe completed the Design for Sustainability certification through the Global Ecovillage Network and Gaia Education. He is a member of Hart’s Mill Ecovillage, a community forming near Chapel Hill, North Carolina, where he lives with his wife Maria and daughter Mia. Contact him at drjoecole [AT] gmail.com. ← Together Resilient: On Class & Race – Half Off!